The TakeAway: Climate change, clean energy, and humanitarian stability operations are mission-critical components of the Defense Department’s policy doctrine and operational stance. As we hailed our troops on Veterans Day, we should also salute the U.S. military for embracing sustainability. While it sounds like an oxymoron, there’s a move afoot to “transform the military industrial complex into the human security network,” according to Gregg Nakano, a military-civilian partnership expert. 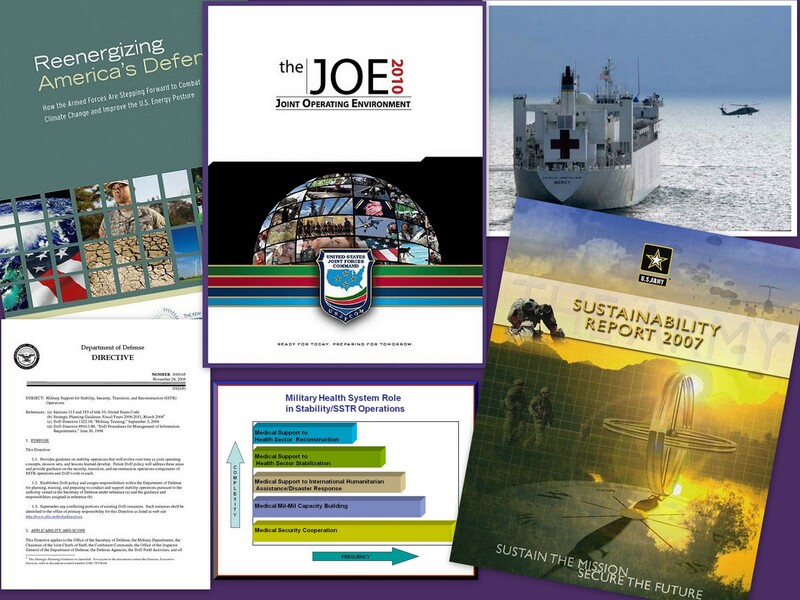 Indeed, clean energy and international relief operations – including indigenous capacity building in conflict zones – are rising up the U.S. Joint Forces Command priority list, recently outlined in the Joint Operating Environment 2010, or JOE 2010. The military’s shift expands the scope of security concerns to include climate change and natural disasters, human rights and health care, and other noncombat operations (so-called “preventive defense”), breaching disciplines and, sometimes, sovereign borders. The Armed Forces recognize that as the world changes, so, too must they—leading by example to meet the nation’s future security needs. The military alone cannot manage the consequences of climate change’s multidimensional and wide-ranging threats. An interagency approach is needed that involves deep and sustained collaboration between the military and a range of civilian agencies, from the intelligence community to climate scientists. Since then, the military has taken steps on both the humanitarian and clean energy fronts. For example, U.S. Navy Secretary Ray Mabus described efforts to dramatically reduce the amount of fossil fuels consumed by the naval services earlier this week at the Carnegie Council for Ethics in International Affairs (CFIA) in New York City. (His appearance is part of CFIA’s full year of sustainability programming.) Reenergizing Our Defense, a February report from the Pew Project on National Security, Energy, and Climate details the steps the Army, Navy, Air Force, Marine Corps, and military bases are taking to reduce energy use and carbon emissions. In September 2008, the U.S. Army released its first Sustainability Report, based on Global Reporting Initiative (GRI) guidelines. Meanwhile, this past June, President Obama asked Mabus, a former governor of Mississippi, to prepare a long term recovery plan for the restoration of America’s Gulf Coast in the aftermath of the Deepwater Horizon oil disaster. In September, Mabus delivered the plan – entitled America’s Gulf Coast: A Long Term Recovery Plan after the Deepwater Horizon Spill – which recommends that Congress authorize a Gulf Coast Recovery Council and Gulf Coast Recovery Fund, among other actions. As for health care, last May the Defense Department issued an Instruction on Military Health Support for Stability Operations, an extension of its humanitarian and disaster response work. This work in international health stability exemplifies the military’s frame change to a human security network, according to Nakano, Development Outreach Coordinator with the Center for Disaster and Humanitarian Assistance Medicine (CDAM), a unit of the Uniformed Services University of the Health Sciences (USUHS). “The 20th Century was about using war and conflict to make unsustainable business profits. The 21st Century will have to be about competing for, rather than competing against the rest of humanity or we will all end up destroying our habitat,” Nakano told The Murninghan Post. Editor’s Note: As part of the beta period of The Murninghan Post, we are shifting from five to three posts a week, on Mondays, Wednesdays, and Fridays. We will continue to augment these with commentaries by other members of The Transition Group, as well as guest commentators and other content. In the meantime, thanks again for all your support! This entry was posted in Climate Change, Human Rights, Natural Disasters, Public Policy and tagged Air Force, and Climate, and Reconstruction (SSTR), Army, Carnegie Council for Ethics in International Affairs (CFIA), clean energy, climate change, Deepwater Horizon, Defense Department, Directive 3000.05, energy, Global Reporting Initiative (GRI), Gregg Nakano, Gulf Coast, health care, human rights, humanitarian, Joint Operating Environment 2010 (JOE), Marine Corps, national security, natural disasters, Navy, Pew Project on National Security, preventive defense, Ray Mabus, Security, Stability, Strategic Studies Institute (SSI), sustainability, Transition, Triangle Institute for Security Studies (TISS), US Army War College. Bookmark the permalink.